Home > Emergency First Aid Kits & EMS Supplies > First Aid Kits > First Aid Kit Inside Sticker - Vinyl Self-Adhesive Label - 4" x 4"
Home > Fire Safety & EMS > Emergency First Aid Kits & EMS Supplies > First Aid Kits > First Aid Kit Inside Sticker - Vinyl Self-Adhesive Label - 4" x 4"
Home > Emergency Kits > First Aid Kits > First Aid Kit Inside Sticker - Vinyl Self-Adhesive Label - 4" x 4"
Home > First Aid Kits > First Aid Kit Inside Sticker - Vinyl Self-Adhesive Label - 4" x 4"
Home > Fire Safety & EMS > Safety Signs - Danger Warning Signs > First Aid Kit Inside Sticker - Vinyl Self-Adhesive Label - 4" x 4"
Home > Safety Signs - Danger Warning Signs > First Aid Kit Inside Sticker - Vinyl Self-Adhesive Label - 4" x 4"
Home > Fire Safety & EMS > Fire Safety Evacuation Supplies & Tools > Fire Extinguisher Arrow Signs > First Aid Kit Inside Sticker - Vinyl Self-Adhesive Label - 4" x 4"
Home > Fire Safety & EMS > Fire Extinguisher Arrow Signs > First Aid Kit Inside Sticker - Vinyl Self-Adhesive Label - 4" x 4"
Home > Fire Extinguisher Arrow Signs > First Aid Kit Inside Sticker - Vinyl Self-Adhesive Label - 4" x 4"
First Aid Kit Inside Sticker - Vinyl Self-Adhesive Label - 4" x 4"
Display these "First Aid Kit Inside" labels to quickly identify your first aid supply locations in the event of an emergency. These vinyl self-adhesive labels are silk screened with UV inks, then clear laminated for durability and fade resistance. 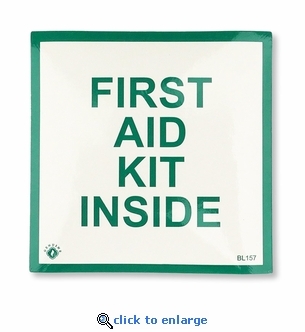 First Aid Station Arrow Sign - Vinyl Self-Adhesive - 8" x 12"
3D Angle First Aid Location Arrow Sign - Rigid Plastic - 5" x 6"
First Aid Sign - Rigid Plastic - 8" x 10"
Emergency Eye Wash Sign Rigid Plastic 8" x 10"
Glow-in-the-Dark AED Adhesive Vinyl Label - 6" x 8"